This is arguably my first trip report in a very, very long time, and it's great to be back! 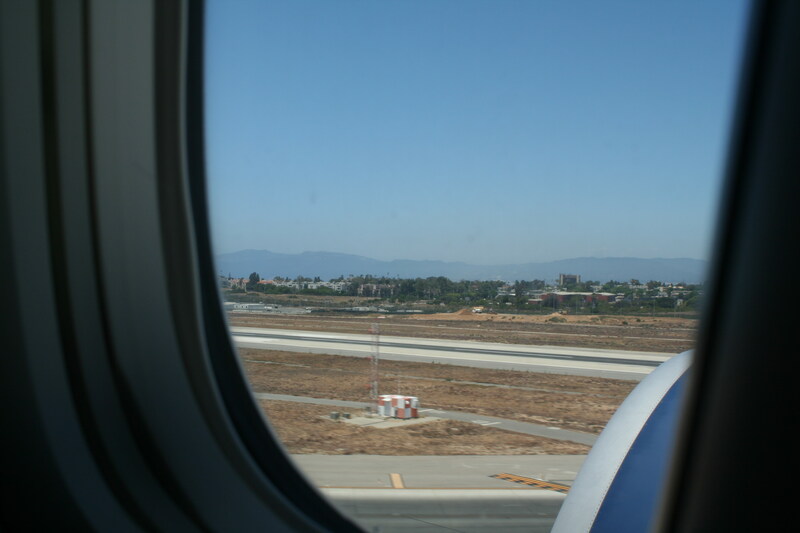 Since my last trip report from 2011 which was posted in 2012 (and, before that, this trip report from 2009 which I posted in 2013), I've taken many notable flights, but have not had the time to even come up with a paragraph of a future trip report. With age, time seems to be an ever scarcer commodity, ever in demand. But sometimes, there are just some flights that are so notable, writing a trip report just seems to be worth it. 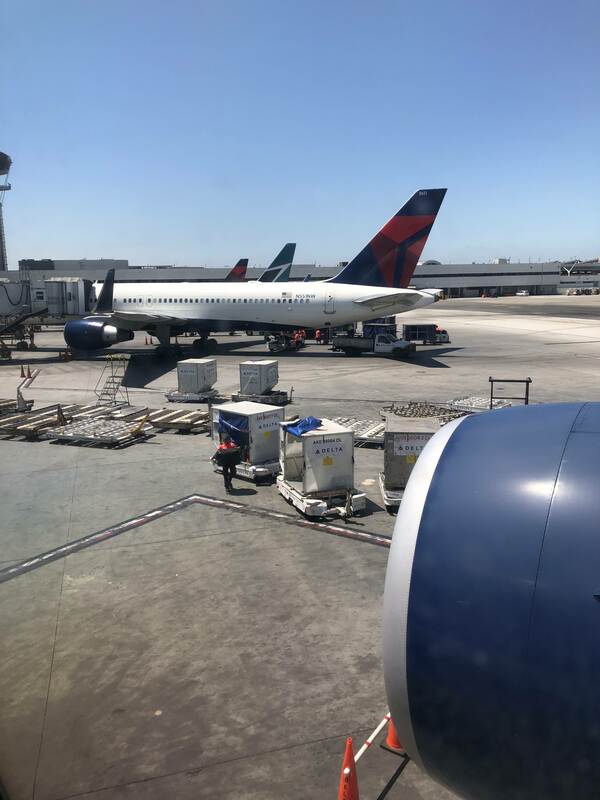 I figured it was time to start writing again, and write again I shall with arguably the most notable set of flights I've taken so far: taking me from SoCal to South as F*** — sorry, South Africa — on Delta Air Lines and, for the first time on Airliners.net, Joon. Every year, the Wikimedia community organizes Wikimania, the annual Wikipedia conference. 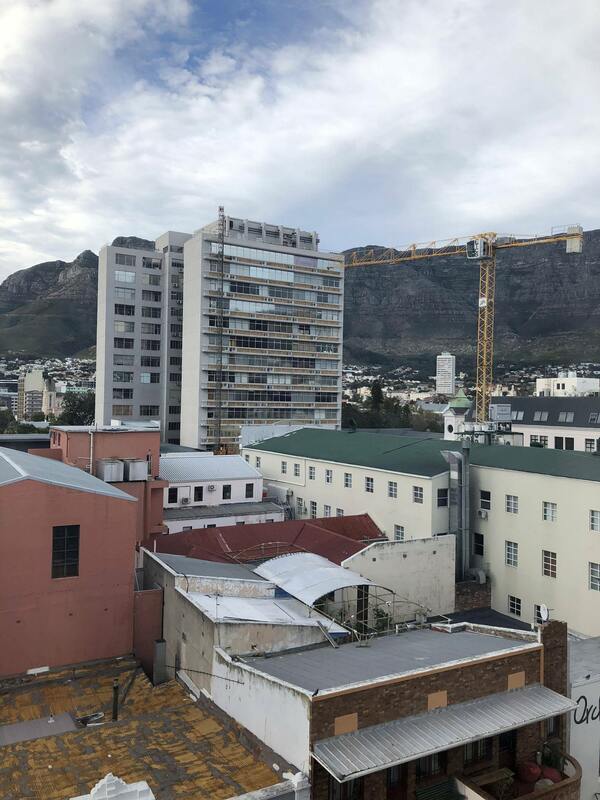 The conference normally rotates between continents, and this year, Cape Town was selected to be the host — the first time a city in Africa was to host hundreds of Wikipedians from all over the world for the next few days. Given the distance (and given the fact that my home airport was now LAX, not MNL), I was concerned that I would be asking for too much, so I found the cheapest itinerary I could find within my preferences (priced at just a hair under $2000) and waited to see if they said yes. Once it was booked, I found myself a cheap hotel to stay in for my first night, and it was off to Cape Town I go! Like most days in Los Angeles, July 14th started out being very sunny. A perfect day to head to LAX, especially for a Saturday. About a month before I was scheduled to leave, my grandfather, who I'm currently living with, expressed his desire to take a vacation in the Philippines. 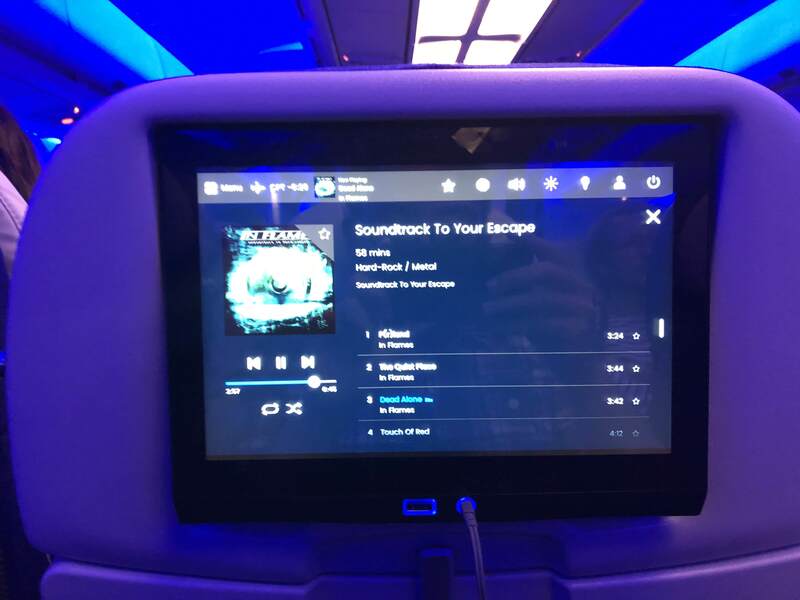 I managed to secure him a really good deal on MU, paying only $490 for his ticket, and though he had yet to fly MU, he was excited to try them since he normally flies KE or BR despite being more expensive. His flight was scheduled to leave 30 minutes before mine, so at around 9:00 am we took a Lyft together to the airport. It was my grandfather's first time to take Lyft, so he certainly enjoyed it. 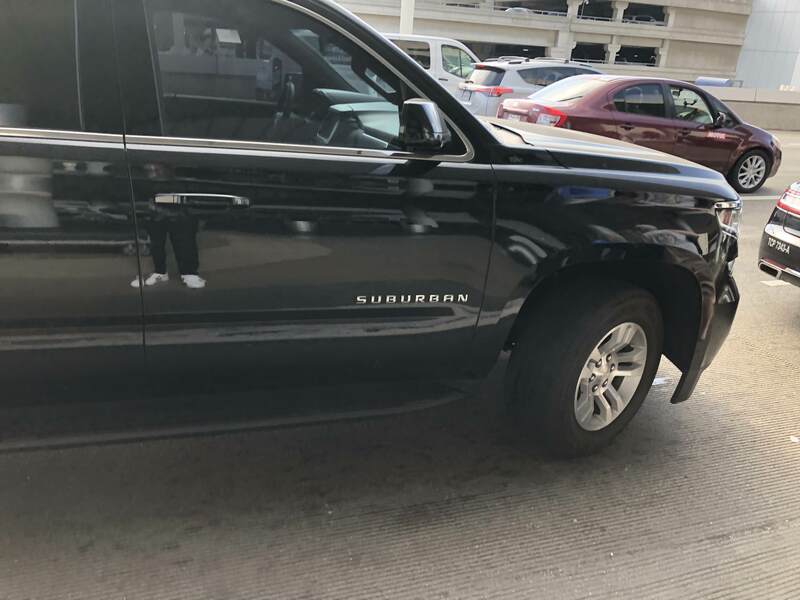 Our Chevy Suburban sped along the 110 and the 105, aided by a lack of heavy traffic, and soon we pulled up into the LAX at the Tom Bradley International Terminal. I accompanied my grandfather to the MU check-in counters, guiding him to the Sky Priority counters (thanks to my status). A friendly Filipino agent checked him in to Manila and called a wheelchair to take him to the gate. She asked if I was traveling along with him, but I said no and noted that, in fact, I wasn't scheduled to fly China Eastern until September! When the wheelchair arrived at the place my grandfather was sitting, I helped him onto the chair and I gave him a hug, knowing fully well that it would be a while before I'd see him again. 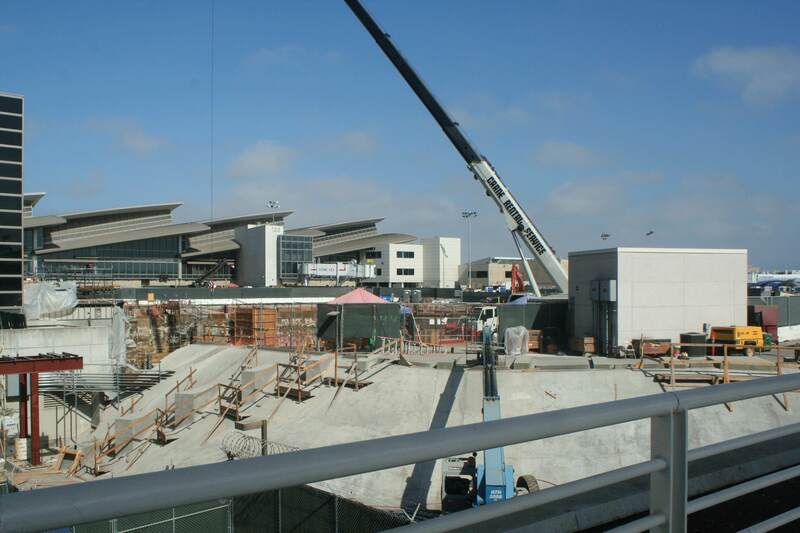 I then exited the terminal onto the sidewalk, walking alongside all this construction happening outside. In no time, I made it to Terminal 2 to check in for my flight. When I arrived at Terminal 2 to check in for my flight, I was expecting a pretty packed check-in area. Luckily, there was no line at the Sky Priority counters. A friendly agent takes my bags and noticed I was heading to South Africa. Apparently it's not a usual destination for people to go to, and he admitted being a little jealous. 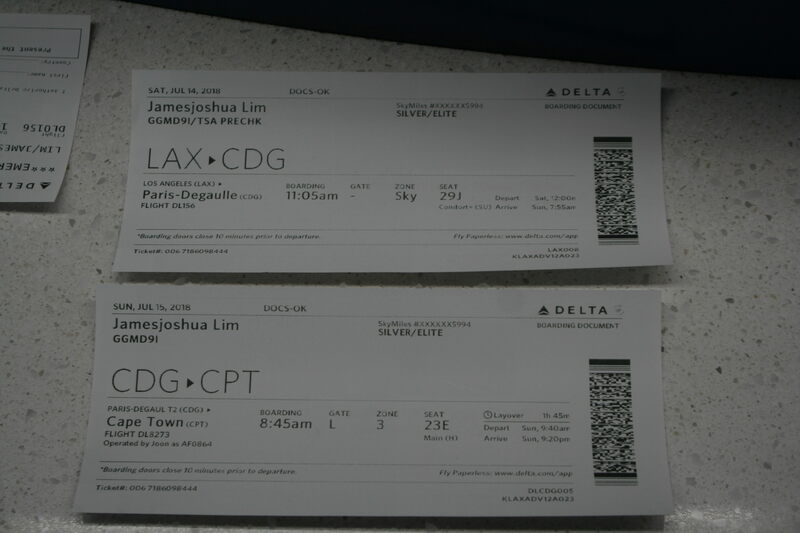 However, it was all good: he handed me my boarding passes and wished me a pleasant flight. Oh great. An aisle seat on my CDG-CPT flight. 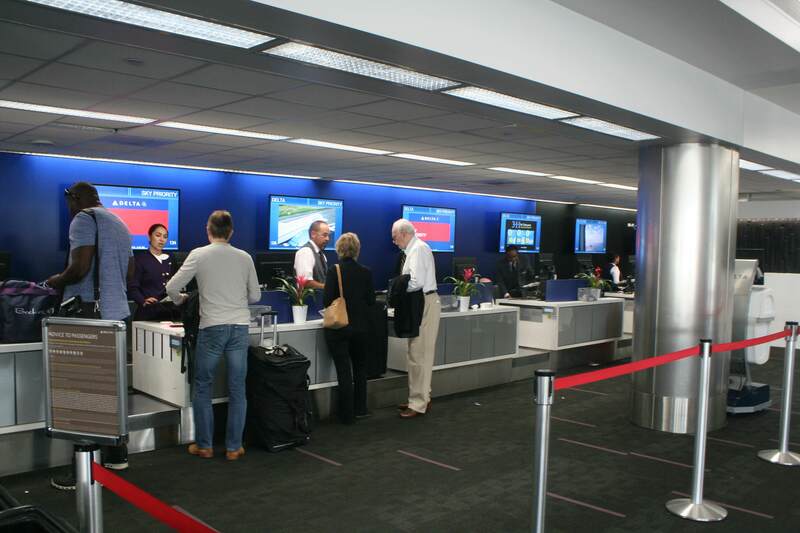 This is what happens when you can't select seats for Air France flights on Delta's website. That said, there was a silver lining. I managed to enroll in Global Entry just a few weeks before, luckily securing an interview at LAX just a few days before leaving which I secured by chance since the next interviews at LAX weren't scheduled until August. I was happy to see the TSA PreCheck clearance on my boarding pass since that meant it was worth it! 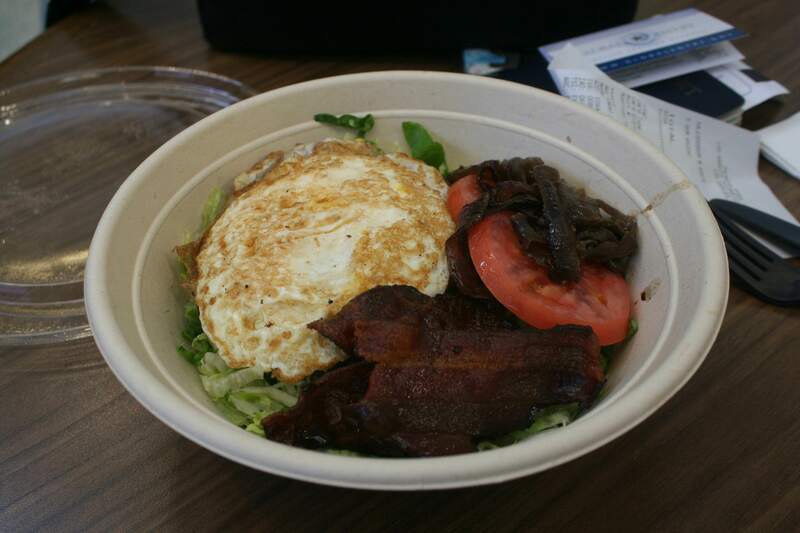 After breezing through security (and learning that apparently, the Sky Priority line is a worse option to fall in line in if you have PreCheck), I went to the foodcourt and got myself a burger bowl from Built Custom Burgers since I didn't have breakfast. At around 11:10, I make my way to Gate 27 for my flight. Looks like this is going to be one packed flight to Paris! Finally, as boarding begins, I fall in line with the other Sky Priority passengers, boarding pass in tow and excited to board my flight. Boarding went by very, very smoothly as I make my way to my exit-row seat on this very long flight, which I was very lucky to score early on when my flight was booked. 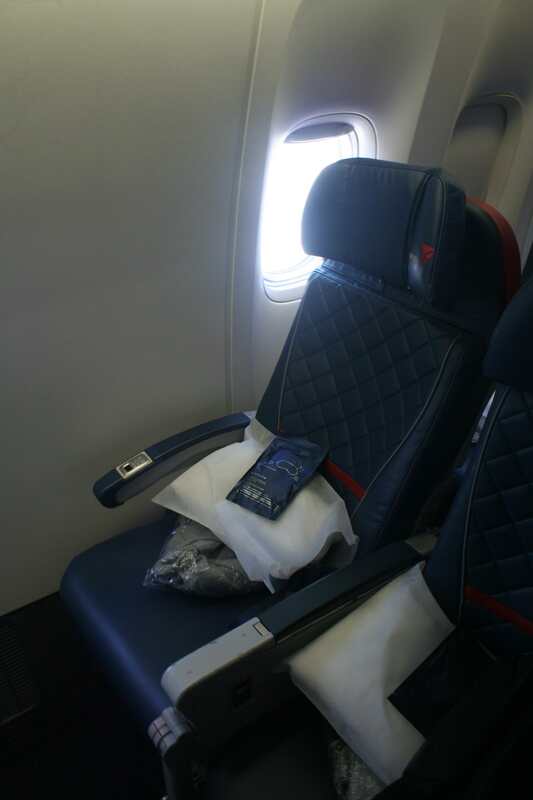 While I was lucky to have scored the seat, I did notice that the cabin was getting worn. 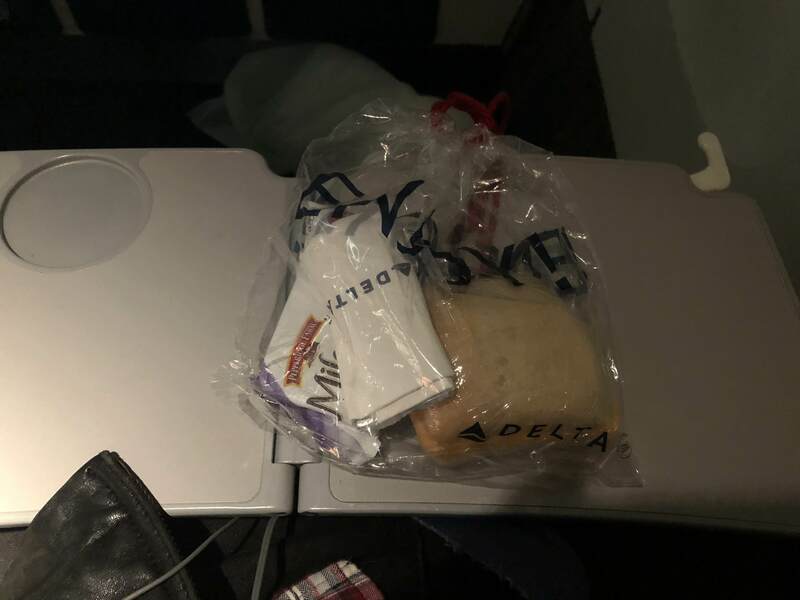 The hard product on Delta's 77Ls had yet to be upgraded to what's been on their 767s and A330s, and the seat had scuffs all over the place as the picture shows. 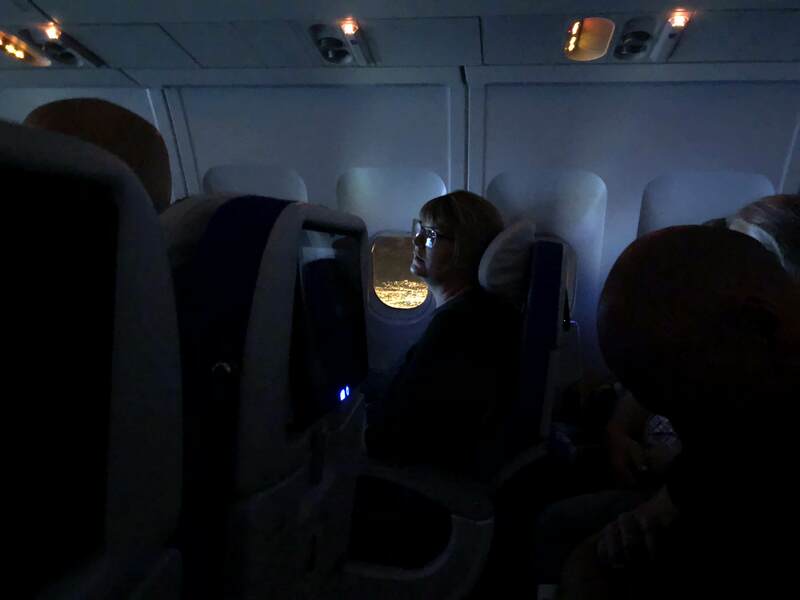 However, the seat was still very comfortable, and on a 10-hour flight like this, the greatest comfort was still, first and foremost, in being able to stretch my legs. That said, you can't deny though that this is a great view. Oh look, it's N551NW heading to DTW! The flight was definitely packed (they announced a full house! ), and coupled with traffic at LAX this meant we would be delayed in leaving by about half an hour. When we finally did manage to push back and make our way to the runway, there wasn't a lot going on from outside my window, but probably something was up elsewhere. The salad was actually quite tasty! I appreciated the contrast between the nuts, beets and greens, giving it a fresh flavor which accentuated the chicken, and the cheeses were simple but nonetheless good. That said, I knew I should've paired this with white wine! While eating, I decided to catch up on several films which I've yet to watch. First up: Love, Simon. Once that was up, I decided to take a nap for a few hours. About 2/3 of the way into the flight, I woke up and it was time to find something else to pass the time with. 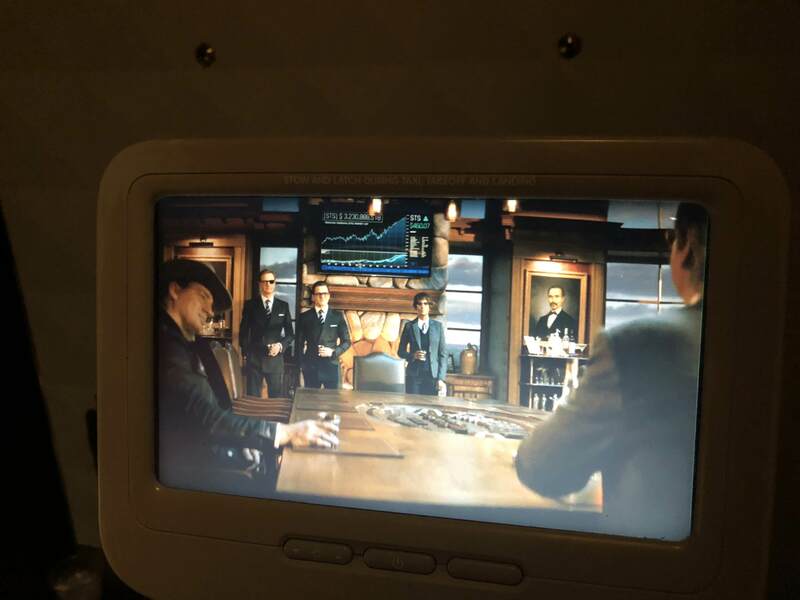 For my second film, I decided to go with Kingsman: The Golden Circle. At least I was up for the mid-flight snack! 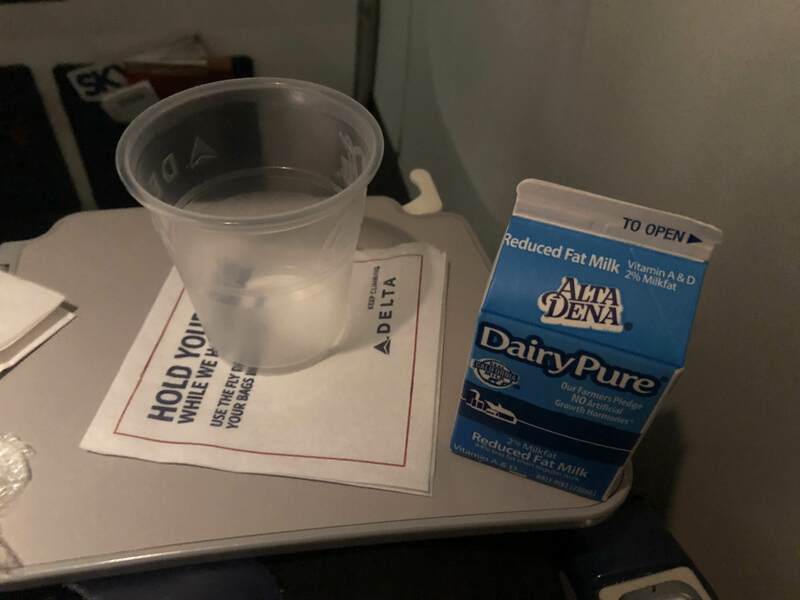 For this flight, they gave out a ham-and-cheese sandwich, Milano cookies and drinks, which in my case was a nice glass of milk. The sandwich was only good enough, but the Milano more than made up for it. About an hour and a half later, breakfast was served. Inside this funky box was honey yogurt, cheese and a muffin, which was paired with orange juice and a hot drink. In my case, since I can't drink coffee, it had to be tea. In fairness, the honey yogurt was a treat, especially since I've never had it before. Everything else though was pretty ordinary, but that's to be expected from a snack box. 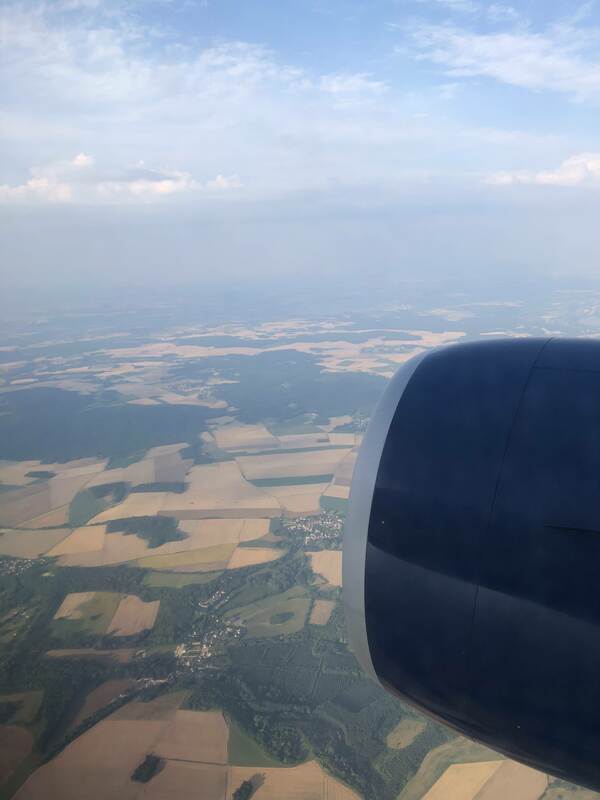 Pretty soon, we were flying over the fields of western France, quietly descending towards Charles de Gaulle Airport. Finally, we land at just over 8:00 am. A very satisfying flight so far, that's for sure! That said, the satisfaction may have been short-lived. Why? Because we parked at a remote stand, that's why! We board the bus which was going to take us to the L gates at Terminal 2E. The bus goes around the back, so I managed to get this shot of N704DK's rear! Once the bus parked, I hurried my way to the transit desk, hoping somehow to change my aisle seat to a window seat. Unfortunately, the agent apologetically told me that the flight was full, so no dice. Defeated but nonetheless in a hurry, I passed through security and made my way to the gate, where this beauty was waiting for me. They weren't kidding though when they said the flight was full! I was in line for over 30 minutes just to board, alongside all kinds of people: a couple of American families, some South Africans, lots of French passport holders of African descent, and even the odd Asian or two. And, a bonus: a friend of mine who is also attending Wikimania happened to be on the same flight! At least I'm not alone, despite being in separate seats. 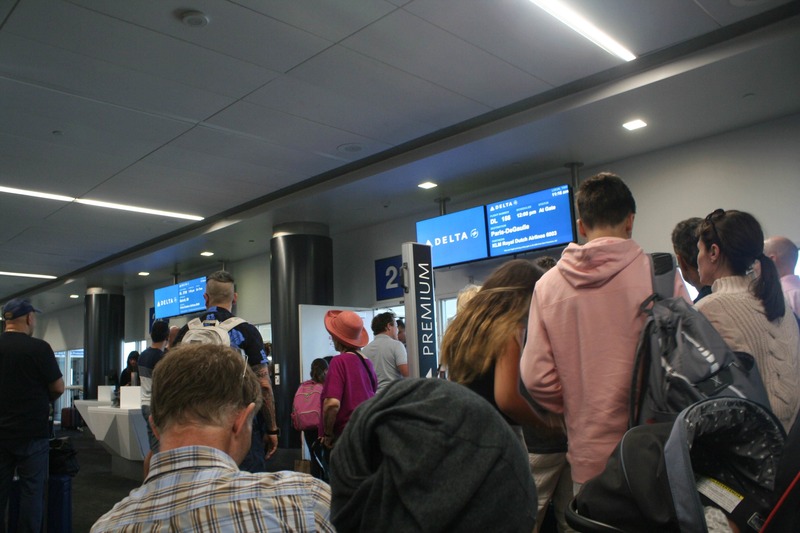 When I made it to the check-in gate, I felt a sigh of relief that, well, I was heading to South Africa. And so I was, excited for the next flight. 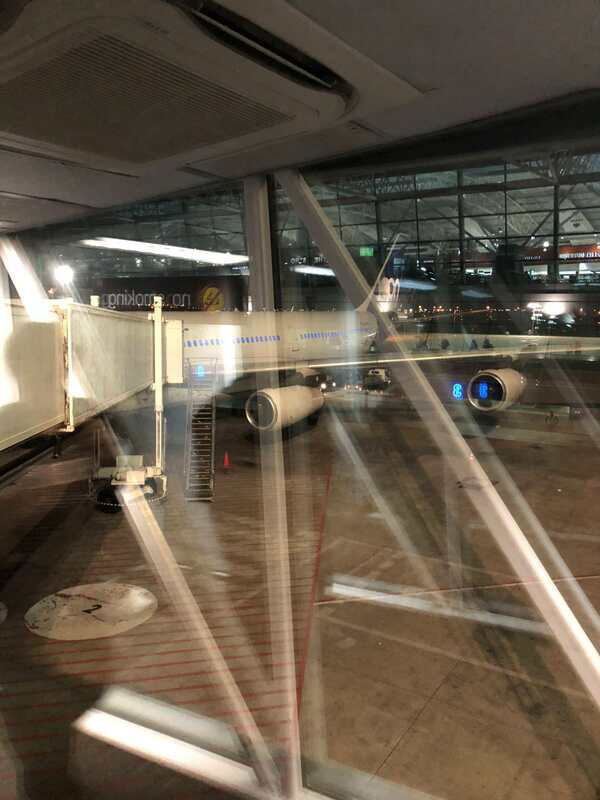 The last time I stepped foot on an A340 was in 2010, when F-GLZN's sister aircraft, F-GLZO, took me from Guangzhou to Paris on my first-ever flight with Air France. 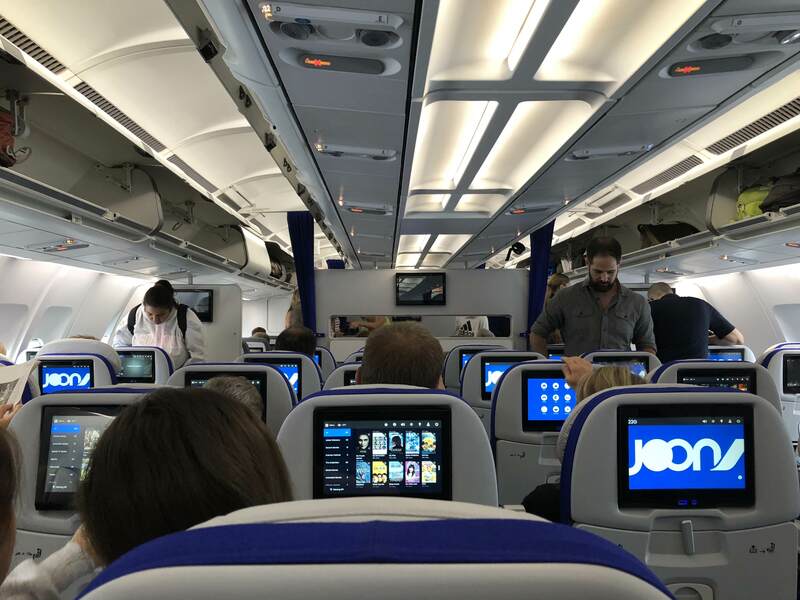 What a difference eight years made: not only were Air France's remaining A340s transferred to Joon, they also featured a hard product that was matched only by Air France's newest planes! Much as I hate sitting in the middle seat of the middle section, at least it did give some great views of the inside cabin. 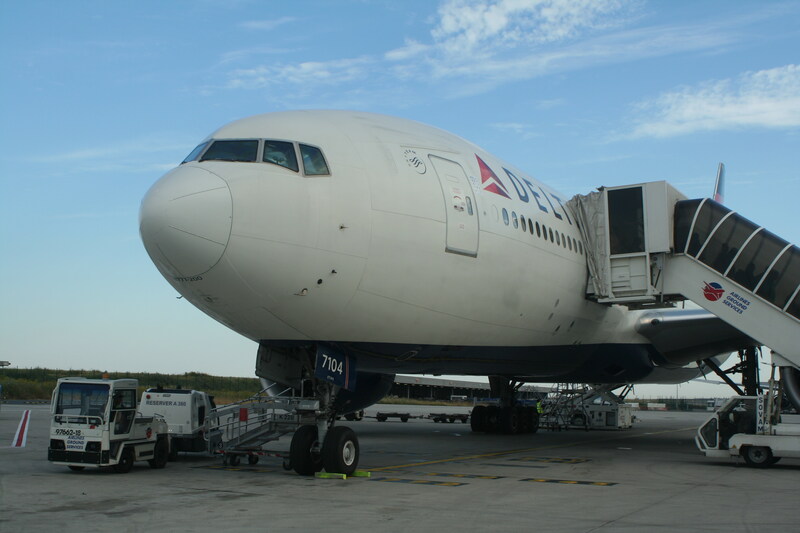 Unlike the earlier flight with Delta, boarding for this flight happened on time despite leaving a little late. 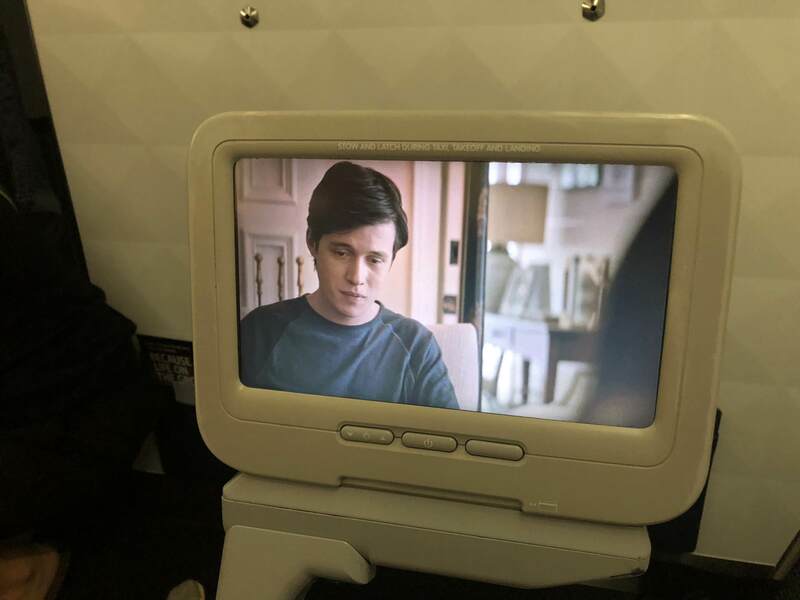 As we pushed back, Joon's funky safety video (à la Air France) played on the screen. We take off, and thus the 12-hour journey to Cape Town finally began. 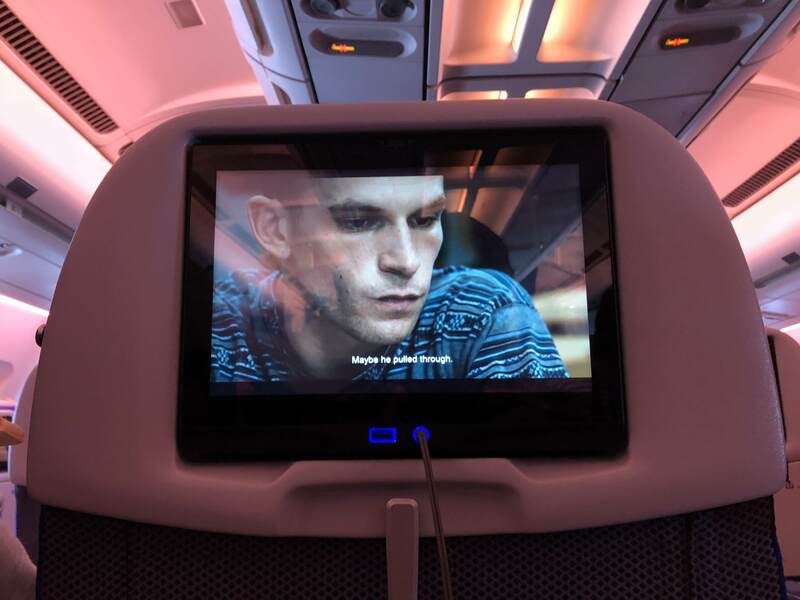 I started this flight with another movie that I wanted to watch: the critically-acclaimed 120 BPM (Beats per Minute). If you haven't seen it yet, you should! 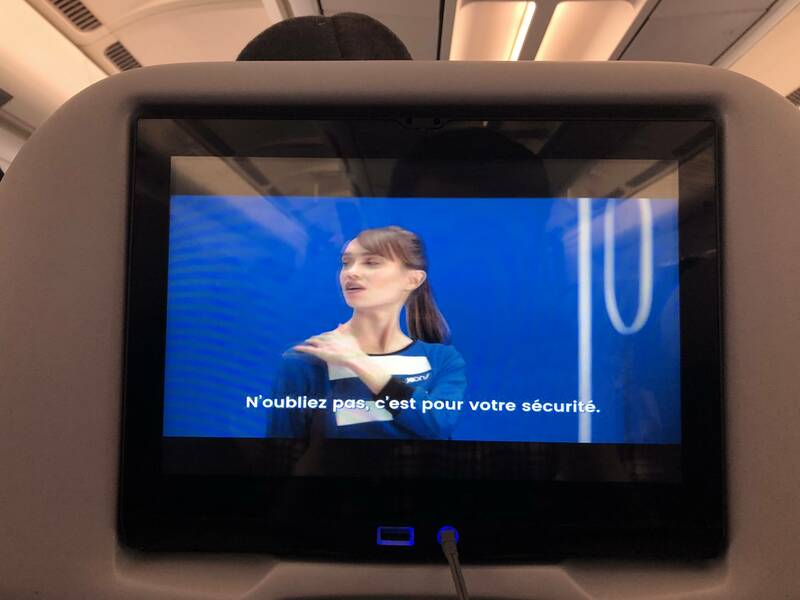 While watching 120 BPM, I saw that there was Wi-Fi on the plane, but apparently I was misled — turns out that it was only for the streaming service that Air France has been rolling out on their long-haul aircraft! The streaming service has more or less the same options as the in-screen monitor, save for some extras like magazines and newspapers, so I opted to skip that entirely. The lunch service begins shortly after I loaded 120 BPM. Why not start with a glass of white wine, right? The food comes shortly afterward. This was chicken with yellow rice, potato salad, cheese, some apple slices and a muffin. Finally, I got the wine pairing right! 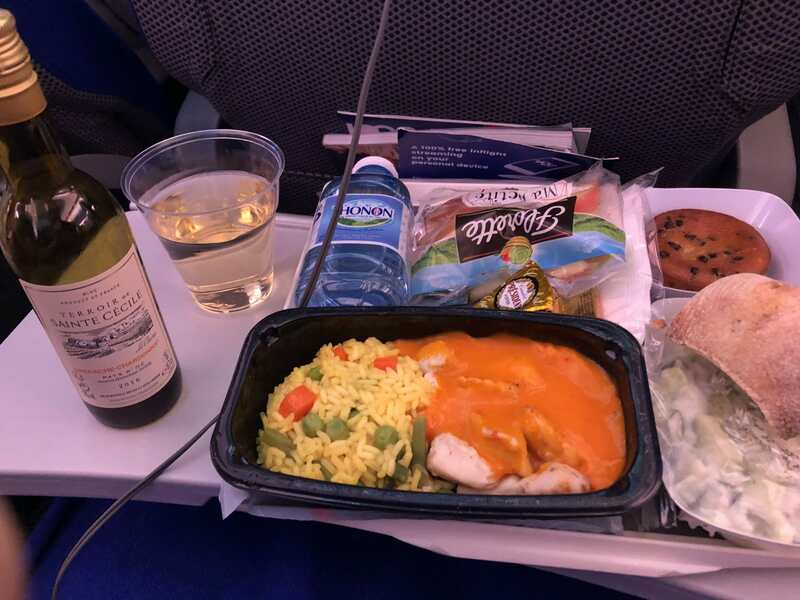 The chicken and rice was arguably one of the best meals I've had on an Air France flight, paired well with the salad and the cheese. The desserts were also a wonderful touch. After eating, I took another nap, and woke up with around four hours left to the flight. 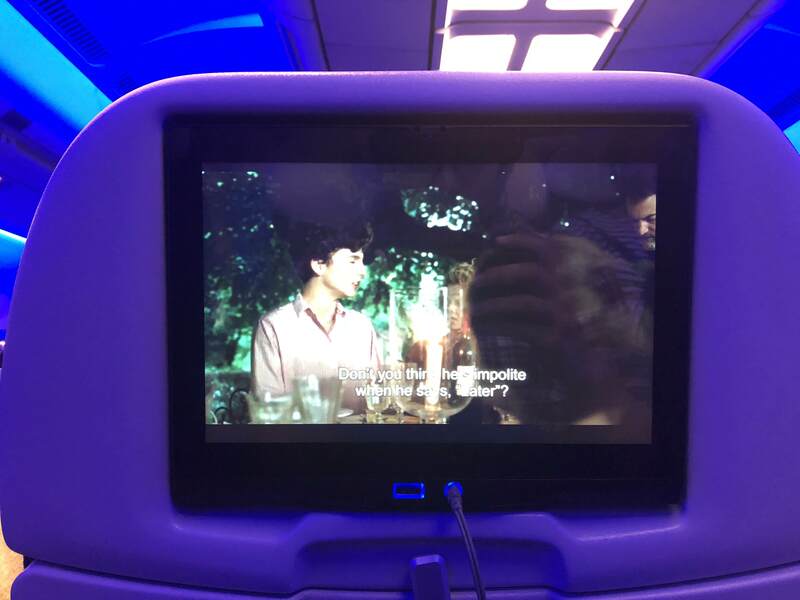 Thus, it was time for the last movie of this flight, and one that I've been waiting to watch for a very, very long time: Call Me By Your Name. Goodness, it was such an awesome movie! No wonder why all my friends have been raving about it. About an hour after I started watching Call Me By Your Name, the second meal service began. 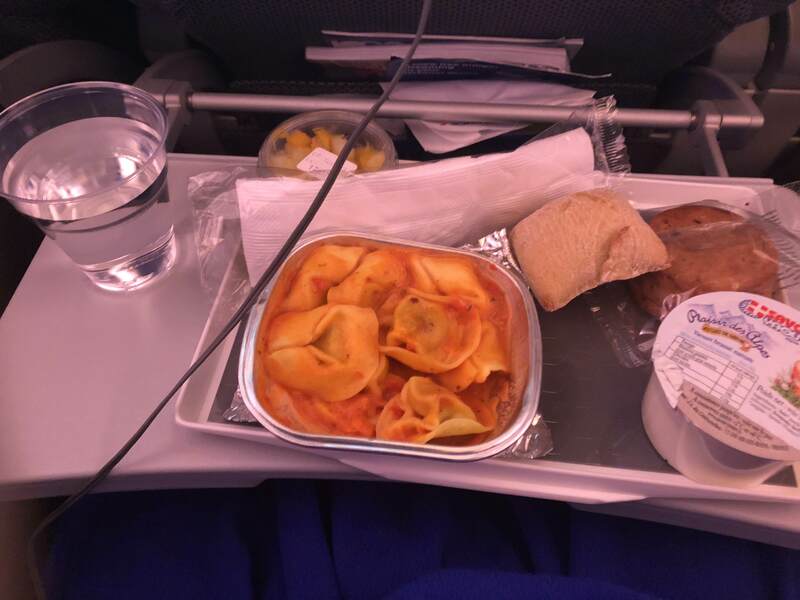 Now it was tortellini with a fruit cup, yogurt, bread and a scone (or is a biscuit?). The tortellini was good although I found the sauce a bit overpowering in terms of the spices. Good thing the fruit and the yogurt were able to counterbalance that. After Call Me By Your Name, I decided to explore the rest of Joon's IFE options. While scrolling through the music section, I noticed that they had an album by In Flames, Soundtrack to Your Escape. As a metalhead, I just had to listen! Meanwhile, the plane started descending towards Cape Town. Wow, that's a bright city! We land at just before 9:00 pm, so it was good to be early for a change! It felt really good to be in South Africa. As we were all leaving the aircraft, I managed to catch up with my friend. But I just had to take the plane docked in Cape Town, since that distinctive Joon tail really stands out! We descend towards immigration, and it turns out that the KLM flight from AMS also arrived at the same time. Many more conference attendees were on the KLM flight, so it made sense to greet people while on queue to be processed by South African immigration. When it was my turn, I had a very short interview with the immigration officer, who then stamped my passport and welcomed me to South Africa. After processing, we were all at baggage claim waiting for our bags. We agreed to share a taxi into downtown Cape Town, so it made sense to wait for each other's bags to come out. That said, for me the euphoric high of that welcome would be short-lived. Why? It turns out that my suitcase didn't make it to the flight! With the other conference attendees noting my panic, I made a beeline for the baggage handler's office. 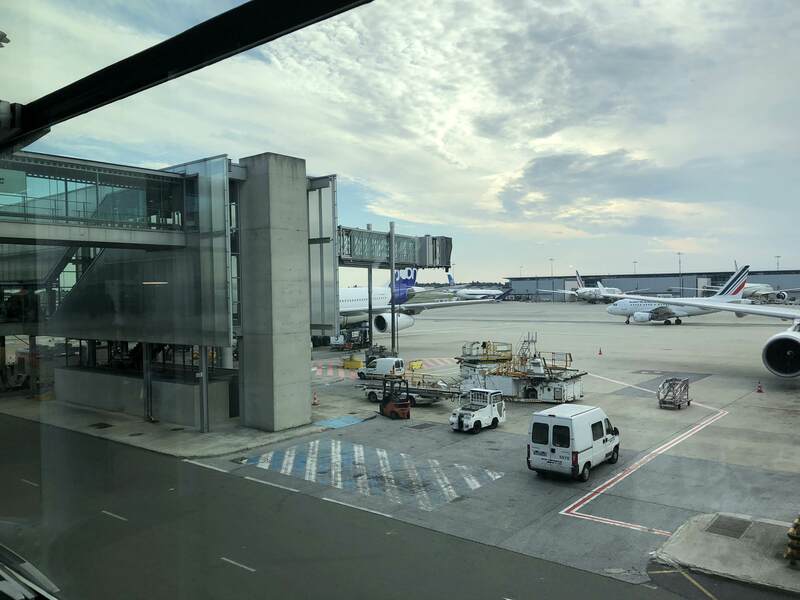 It turns out that my bags weren't loaded on the flight, which was unusual since I've transited through CDG many times with nary a baggage issue in sight. They gave me a case number, and they told me that I have to process reimbursement with Air France while my suitcase was stuck in Paris. The agent did say he was hopeful it would be loaded on tomorrow's flight. The other attendees did offer to help me out, including lending me money to buy much-needed clothes, but I turned them down. I stressed that I would be okay, so we all went out to the taxi rank and boarded a taxi to the Cape Sun, the hotel where the conference was being held. I then called an Uber to take me to my hotel for the night. Getting a good night's sleep was somewhat helpful in calming me down, but what immediately took me aback the next day was the view from my hotel. Table Mountain looks so close from here! Immediately though, I had to buy clothes and other toiletries, since everything was stuck in Paris. I put on my clothes from the night before and went out to find a place to buy clothes. 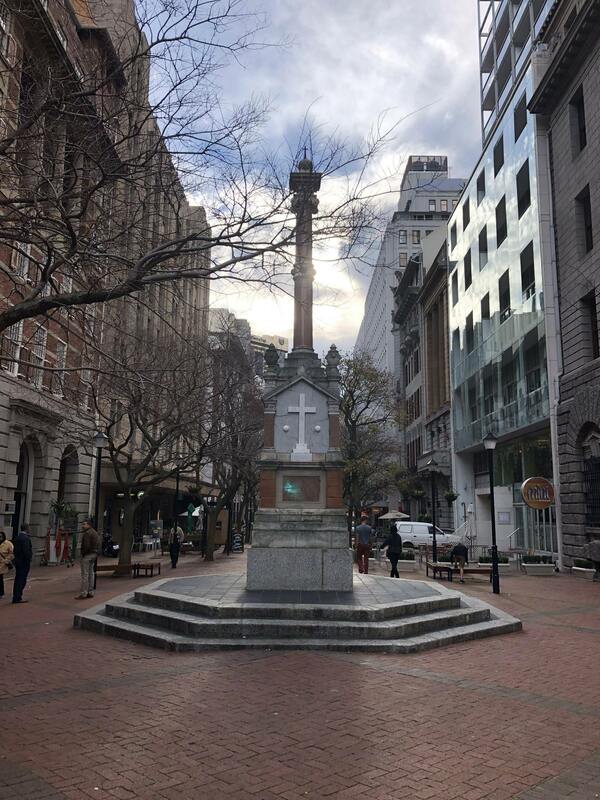 I was pointed to Woolworths and the nearby stores around Adderley Street, but while heading there, I did see some interesting sights. 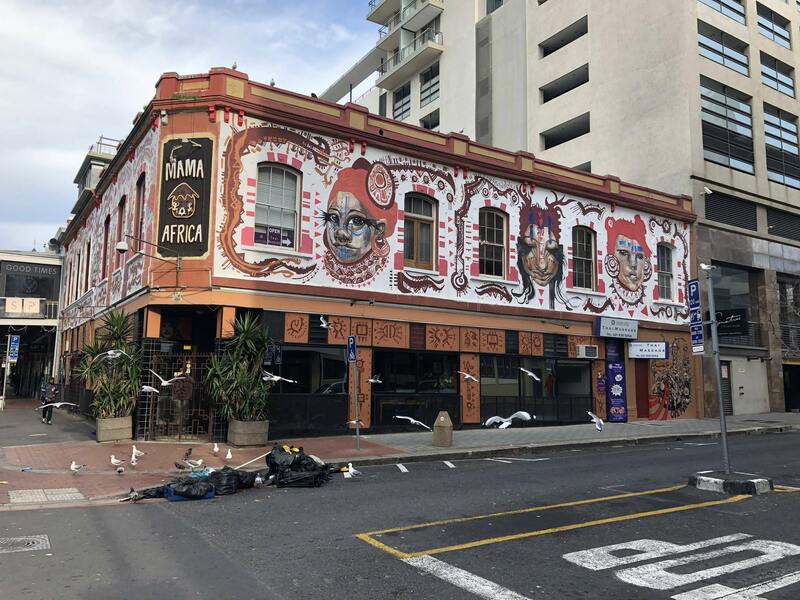 This, for example, was the famous Mama Africa café right beside my hotel. 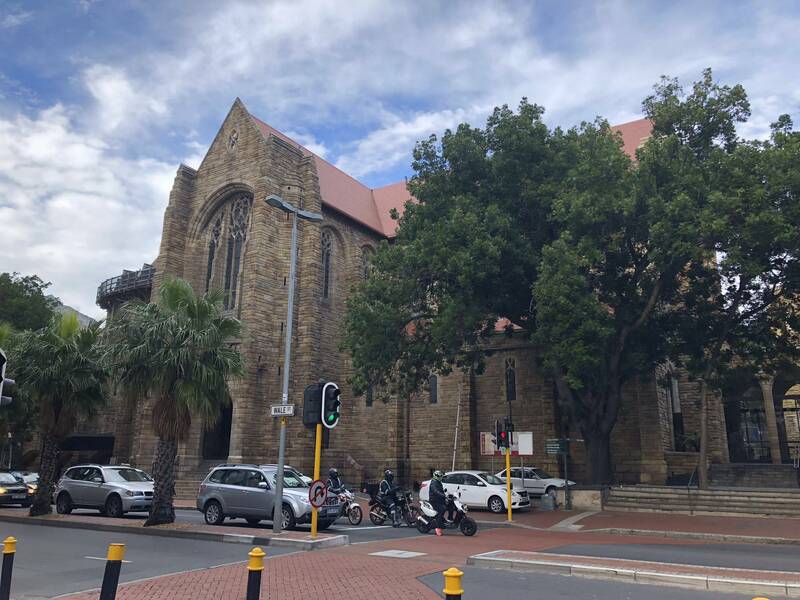 A short walk later (and after a detour to the pharmacy), I made it to St. George's Mall, with St. George's Cathedral looking behind. I managed to buy some clothes, some toiletries and, most importantly, a new weighing scale (since my weight maintenance regimen requires me to check my weight daily). While doing that, I met a local friend of mine who was going to show me around the city today. We make it back to the hotel so I can take a shower and eat breakfast. Once that was done, it was off to see the sights! We were going to pass by the Cape Sun first so I could register and see who else was there. 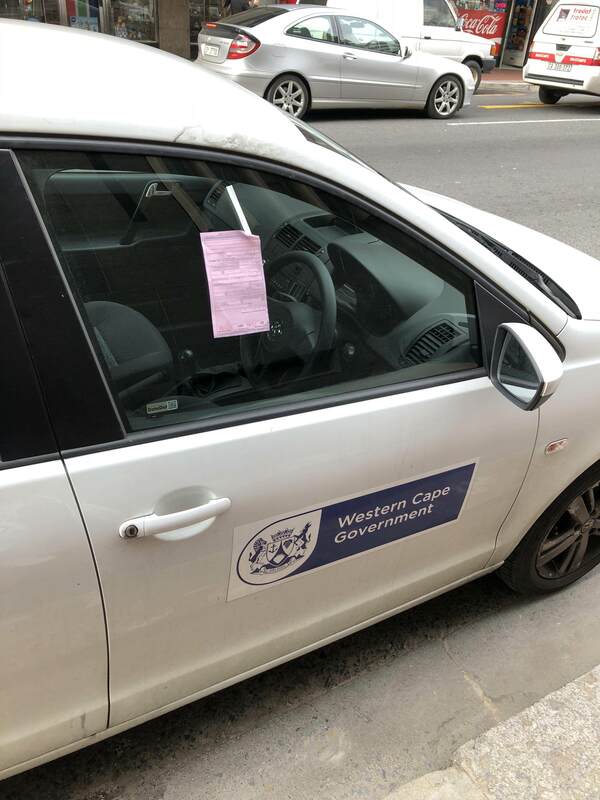 While walking, we passed by such an unusual sight: a government vehicle (in this case, owned by the government of the Western Cape, the province where Cape Town is) with a parking ticket. The friend of mine who was on the CDG-CPT flight last night was going to tour with me, so I picked him up and we make it to the Cape Town Public Library, where my local friend was waiting. He wanted to show us the U.S. Consulate-sponsored business section of the library, which he claims is the most modern facility of its kind in South Africa. After hanging out for a bit in the library, we then made our way around the city. 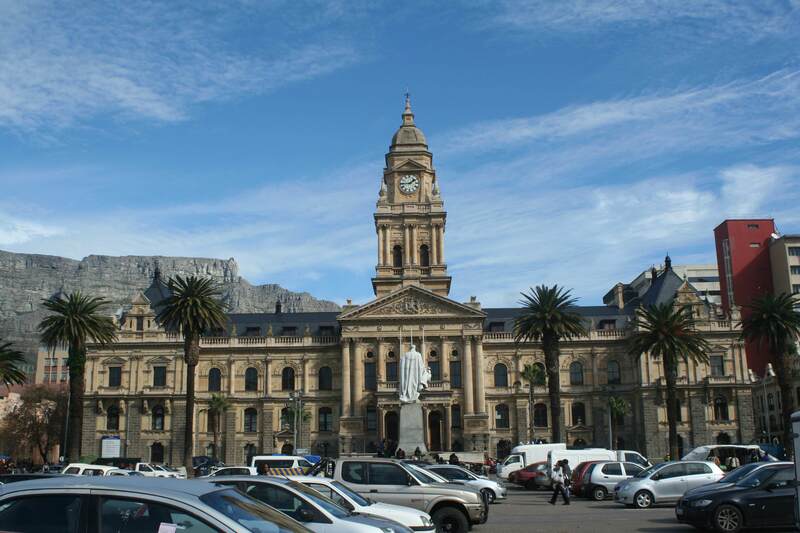 First stop: Cape Town City Hall! When Nelson Mandela was released from imprisonment in 1990, he delivered a speech from the building's balcony to very, very large crowds, offering peace while also claiming that the African National Congress's fight for racial equality wasn't over. A statue now stands where he once stood. 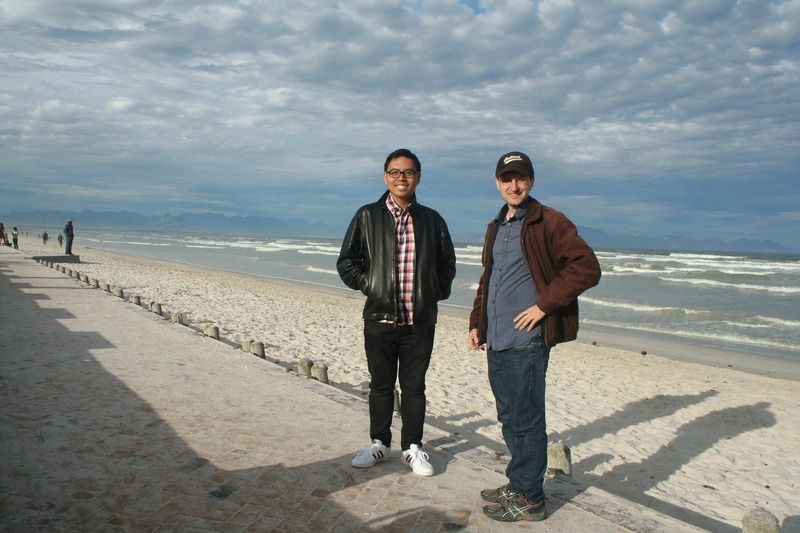 Later on, we had lunch at a nearby foodcourt before heading to Muizenberg, a beachside suburb. 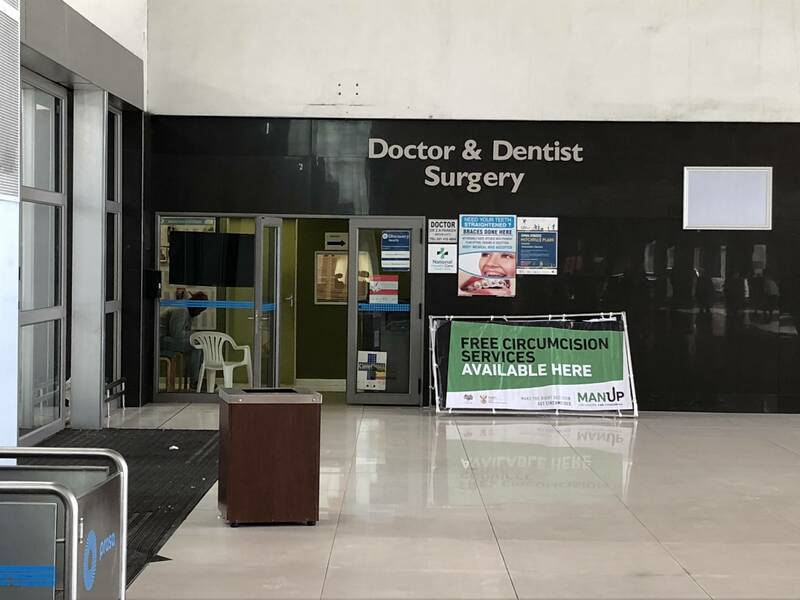 Trains leave from Cape Town's main train station just a stone's throw away from downtown, and in fact, it's so close to downtown, you can even avail of dental services at the station. Now that is good dental hygiene awareness. Apparently, they even offer circumcision services at the train station. How convenient! The visibly aging Metrolink train takes an hour to get to Muizenberg. No pictures of the train on this trip, but I remember seats with missing pieces of foam, lots of ads for witch doctors and mediums, and people from all walks of life aboard. You had street vendors, students, office workers and tourists all in one place, and for a moment it seemed that all the people in the world could peacefully coexist. 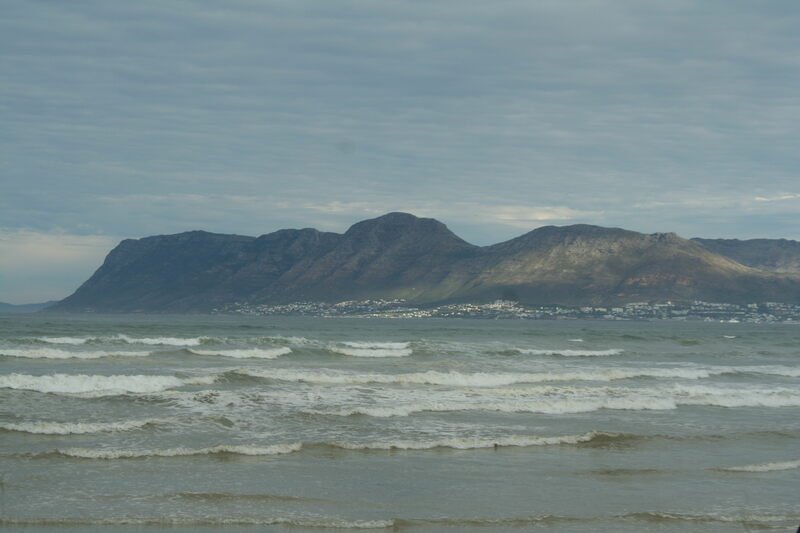 When we got off at the station in Muizenberg, the first thing that catches your eye is the majesty of the Cape of Good Hope, long regarded as one of the ends of the Earth. 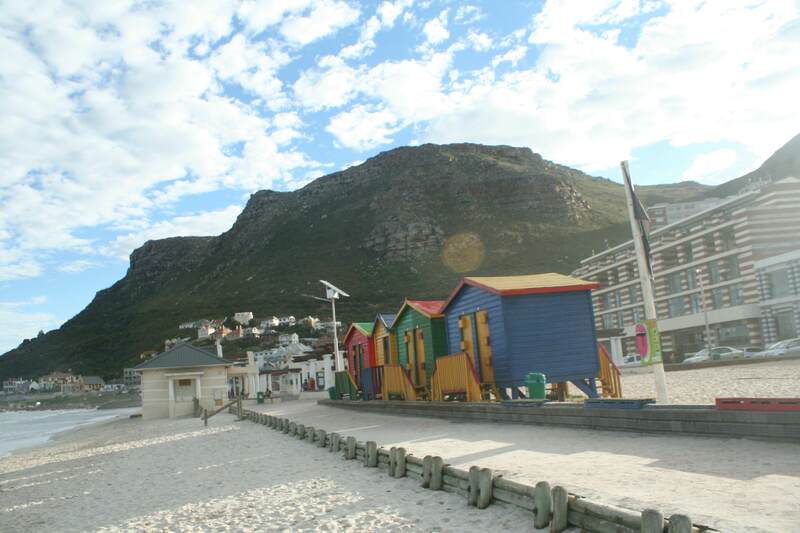 Muizenberg however is known for its bustling beach and its many colorful beach huts, similar to Brighton in Melbourne. My attire was wholly inappropriate for the beach, but that's what happens when your suitcase is stranded in Paris! 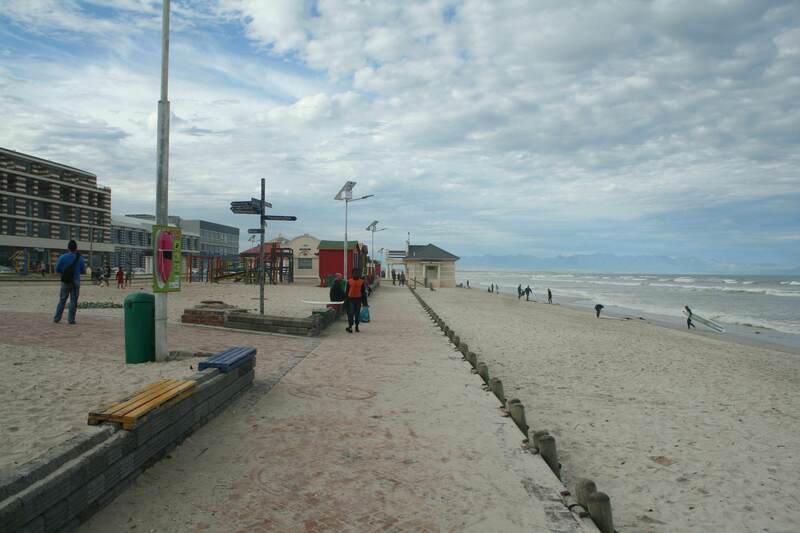 After about an hour on the beach, we take the train back to Cape Town and make it back to the Cape Sun. 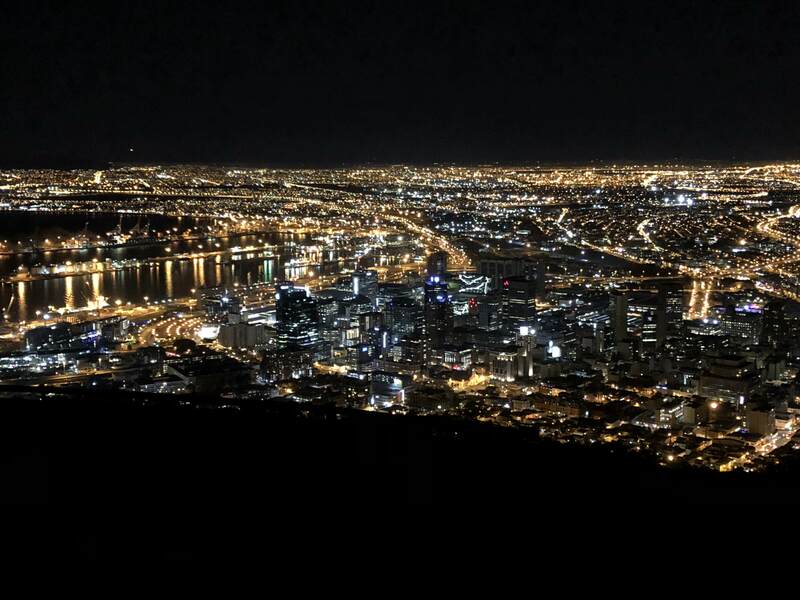 My local friend decides to go home, but we decide to tag along with another local and a few other conference attendees as they drive up Signal Hill for a picturesque view of Cape Town at night. Look at all those lights! I bet it looks even better in the daytime. We then drive down and grab some dinner at a nearby Italian restaurant. 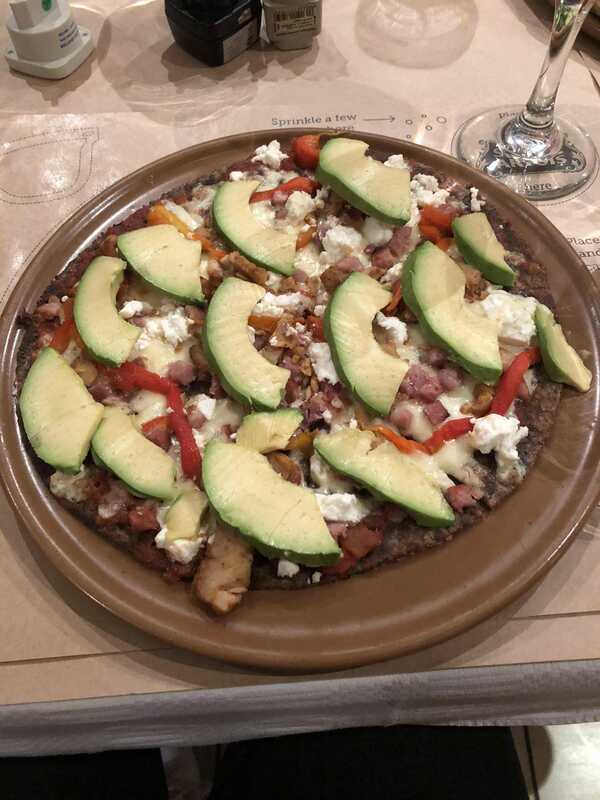 It was in South Africa where I finally had my first cauliflower pizza, and it was superb. Through a scenic drive along the Cape Town coastline, we arrive back at the hotel to mingle with other conference attendees, and finally retire for the night. That said, the suitcase problem aside, this trip affirmed the very reason why all my intercontinental flying is on SkyTeam. 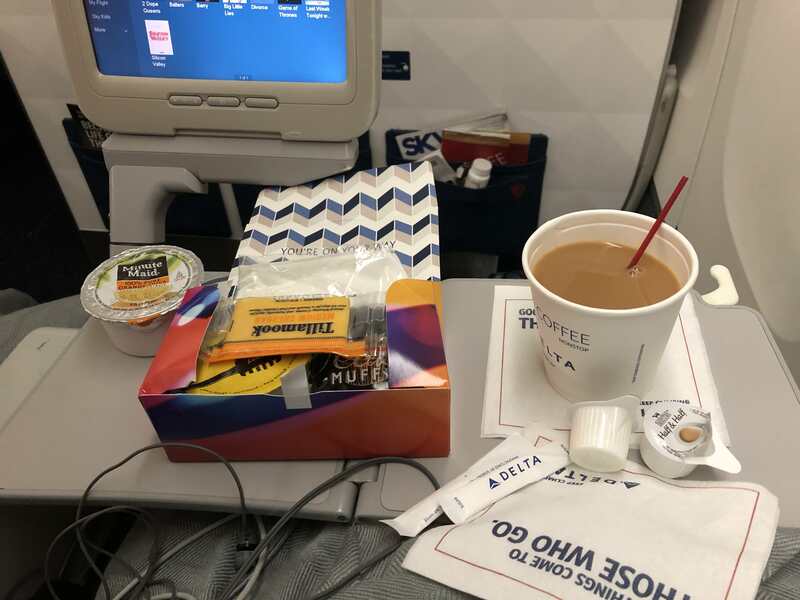 Delta's service has improved significantly on international flights, so much so that I can finally get rid of those awful memories of the catering on DTW-AMS back in 2011. Although DL is not my primary international airline (that task falling to MU on my runs between Asia and the U.S., which is the bulk of my international flying), on the times when I've flown them I've seen constant improvement, and the fact that DL has consistently improved continues to amaze me. Looks like "Keep Climbing" really does live, and it's why I feel like sticking it out with DL was the right choice for this ex-NW flyer. Joon, meanwhile, shows a lot of promise. 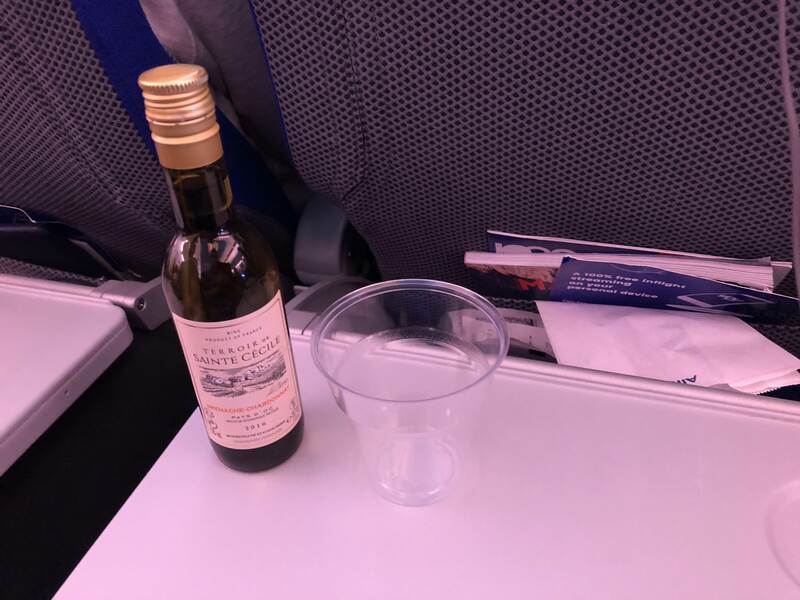 I found JN to be less uptight than AF, both in terms of how the F/As approached their passengers and in the overall ambiance of the flight, and I think this is something that should be lauded. That said, a more laid back atmosphere certainly doesn't translate to complacency, and I found JN to be just as good as AF in the air, if not better (e.g. the IFE, which can't be said for AF's A380s, for example). If I ever get the chance — however unlikely — to fly Joon again, especially on one of their long-haul flights, I definitely would. It feels really good to finally write this trip down. If you made it all the way to the end, I'm eternally grateful for you bothering to keep up with me, especially given my proclivity for verbose, exacting trip reports. To that, I would like to say Enkosi (thank you in Xhosa, the native language of Cape Town), and as in years past, comments are always appreciated. I really hope to start writing more reports (again) in the future, whenever time happens to be on my side. Last edited by atcsundevil on Tue Nov 27, 2018 12:45 pm, edited 1 time in total. Very nice report, and I enjoyed seeing the Joon portion too. I have heard they are good, so it's nice to see a report about them. I see you received cash for your clothes from the Wikimedia Foundation. Didn't you have travel insurance? Most travel insurance will cover you for clothes you have to buy when your luggage is lost or delayed, with a sliding scale of amounts depending on the duration. If you didn't have travel insurance, I'm surprised you travel without it, because everyone should have travel insurance when going abroad. Great set of pictures, which really showed everything on board and I enjoyed the pictures on the ground in Cape Town. I think you should find the time for another report. Really enjoyed this one, so thanks for sharing! highly recommend reading the Love Simon book (Simon vs the homo sapiens agenda). I powered through it in like 3.5 hours and found it to be great - some differences from the book that were good to see. enjoy! Delta catering seems to have improved! Same for United but Alas not American. 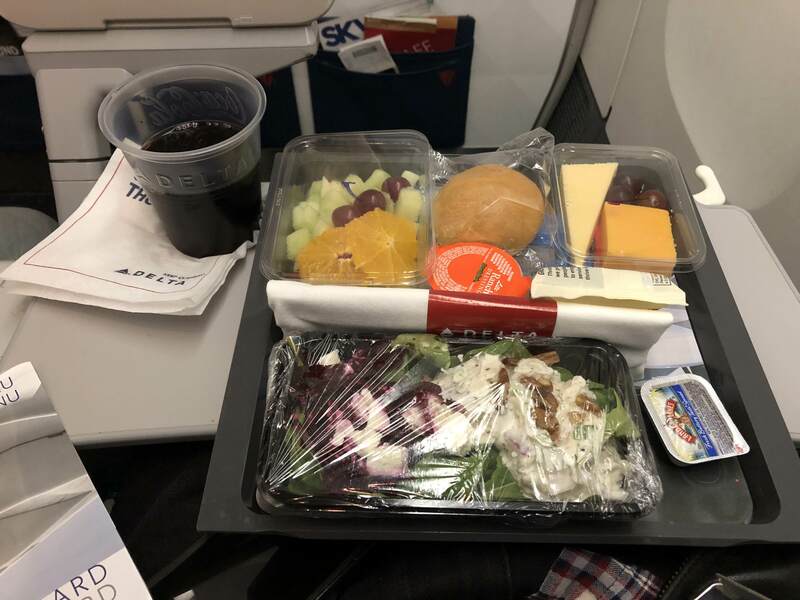 We flew on JOON in Business Paris to Seychelles and let me tell you that your economy meal looks way better than the food we got! LOL. But we loved the crew. Roissy is an awful airport though and often someone is on strike. What a bummer about your luggage! We were lucky they were not on strike. As to Mama Africa it's a disaster. We waited 1 hour for the meal and it was the worst meal we had during our 3 weeks in South Africa. Our hotel sent us there and I never forgave them. We wanted to go to a Township for dinner a nd the hotel discouraged us and sent us here. Thank you for your very nice report! I enjoyed reading every line, your accuracy and style in writing are a bonus. I'm glad you enjoyed all the trip, South Africa is a lovely country for a holiday, even if personal safety can be a concern and limits your freedom to wander carelessly. Delta and Air France (or whichever brand they come up with to avoid more claims for pay rises from AF unions) seem to be doing a good job. Thanks for the comments so far, everybody! The Wikimedia Foundation provides insurance, so I didn't need to buy it for this trip. I normally travel without it (since I go to places where I don't really need it, e.g. the Philippines or the U.S.), but now that I'm traveling more often on my own, I might look into it. My upcoming trip to India, for example, would be one of those trips where I need to get insurance, and I'm planning that accordingly. Hopefully! Need to find time though. Hope I get to snag a copy! Delta catering seems to have improved! Same for United but Alas not American. LOL. But we loved the crew. Roissy is an awful airport though and often someone is on strike. What a bummer about your luggage! We were lucky they were not on strike. 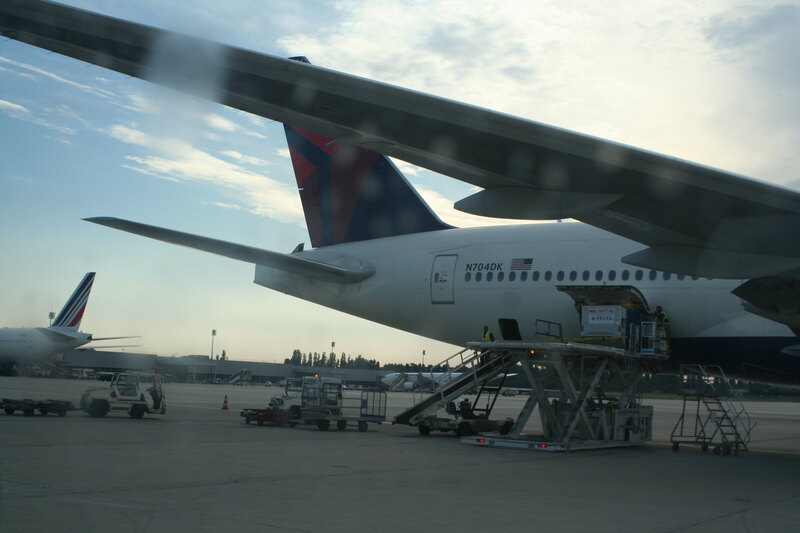 I remember transiting in 2011 on WAW-CDG-DTW-PIT, and there were protests going on inside the terminal. Nothing out of the ordinary happened though, so I wonder why it happened now. Then again, I probably should correct myself: KL did misconnect my luggage once on WAW-AMS-LYS, but at least I got the suitcase the next day. Waiting five days is very, very unusual. As to Mama Africa it's a disaster. We waited 1 hour for the meal and it was the worst meal we had during our 3 weeks in South Africa. Our hotel sent us there and I never forgave them. We wanted to go to a Township for dinner a nd the hotel discouraged us and sent us here. That is definitely true! Really enjoyed the airlines I've flown with (DL, JN, KL), but moreso I really enjoyed South Africa. Friends of mine have been there before and they were raving about it, so at least I can say now that they were right!